At least 26 people have died and thousands more have been evacuated as Cyclone Ockhi hit southwestern India this morning. Ockhi barrelled into the Lakshwadeep islands in southwestern India this morning after drenching the neighbouring states of Kerala and Tamil Nadu. The storm has so far claimed at least 26 lives, killing 13 in India, and 13 more in Sri Lanka, with officials saying many fishermen are still feared to be trapped at sea. Authorities including the National Disaster Management Authority (NDMA), India's Coast Guard and Navy have rescued around 223 fishermen and evacuated thousands of people from cyclone hit areas, officials said, as they continued their operations. Nearly 9,000 people have sought shelter in relief camps. Scores of locals suffered flooding and loss of power and telephone lines, as winds of up to 130km/h swept the region. Weather experts warned of more heavy rains to come, as the water level rose in several rivers in southern India. The tiny Indian island of Lakshadweep off the country's western coast braced for winds of 145km/h. 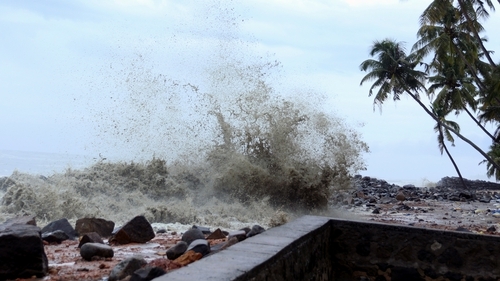 The Sri Lankan disaster management centre said 77,000 people in 16 districts have been affected, with the highest number in the southern Galle district. Thousands of people are in Sri Lankan relief camps amid widespread destruction of property. Authorities are on red alert in coastal areas, with five deaths already reported in Kanyakumari on the southern tip of India. Schools and colleges in parts of India's southern states have been shut as authorities try to restore nearly 4,000 snapped power lines. The Kerala state emergency department said nearly 3,200 people were in relief camps. "Seven people died in several incidents and 218 were rescued from the sea," one agency official said. Weather officials said the storm was likely to move north into Tamil Nadu and the east coast state of Andhra Pradesh in the next four days. India's eastern coast - including major cities like Chennai and Bhubaneswar - are prone to storms that wreak immense damage between April and December. While Cyclone Ockhi was said to be weakening, another tropical storm was brewing in the Bay of Bengal on the east coast, officials said. Indian Prime Minister Narendra Modi has spoken to the chief minister of Tamil Nadu, assuring him of support operations including necessary funds, according to local media. Ockhi is expected to travel north towards Mumbai and Gujarat in the next 48 hours, according to the Indian Meteorological Department (IMD), though it is likely to lose intensity. "The intensity of the wind may come down and the cyclone could change into depression," they said, adding fishermen have been warned not go to the sea for the next few days as waves are likely to be 3-5 metres (12-15 feet) high.